LY2 | What Does LY2 Mean? LY2 means "Love You Too". LY2 (Love you too) can be written a number of ways, including ILU2, ILUT, and LYT. Mother: Don't forget your satchel! ILU. 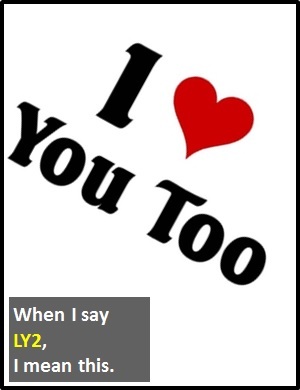 LY2 is used as a standalone declarative sentence (i.e., a statement) with the meaning "I love you too". Of interest, LY2 is classified as a cyber term as opposed to an initialism abbreviation or an acronym because the "2" is a homonym of "too" not the initial letter. Before the digital era, we would have just said "I love you too" instead of LY2.